Yes, it's an egg. But what wild bird species laid it? I came across it on Switha in June 1992, but that isn't much of a clue. Hi Dad. Without knowing the scale, is it a Scarfie's egg? You seem to be the only one willing to chance your arm David. Sorry to be so slow in responding. Yes, the lack of a size-comparison is a drawback, but your diagnosis isn't a bad one, albeit an incorrect one. 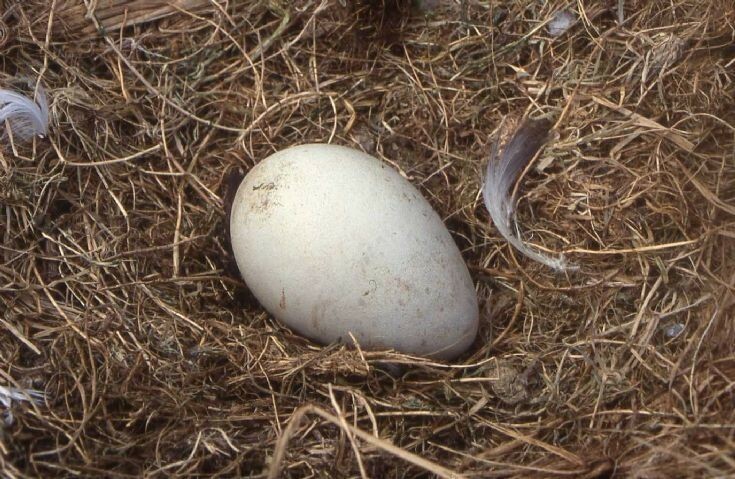 The small feathers around the egg don't look as if they came from a Shag, and in fact it is an unpigmented egg from a Herring Gull. Pigmentation is about the last thing to be acquired by a bird's egg before it is laid, and occasionally the process fails, I don't know why.